Duty free is a dangerous place. On returning from sun, sea and sand, you need a post-holiday blues pick-me-up. Where better to find one than at the beauty counters whilst bored, burnt and with some leftover foreign money in your purse, waiting for a stuffy flight home. 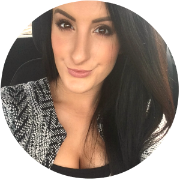 Nars was my weakness on this occasion and, having only tried one of their lipsticks before, it was time to try out some more. With one hand covered in swatches and looking a bit rashy, I ended up taking three shades to the till and I don't regret it one bit. Catching my eye this time, were Dolce Vita, Mayflower, both from the sheer line and Niagara, which has a satin finish. As you would expect, the sheer lipsticks are lighter in coverage and allow your natural lip colour to show through, altering how the shade looks from person to person. Without being sticky or too thick, this formula covers the lips in a veil of moisture, making them comfortable to wear and glossy-looking. 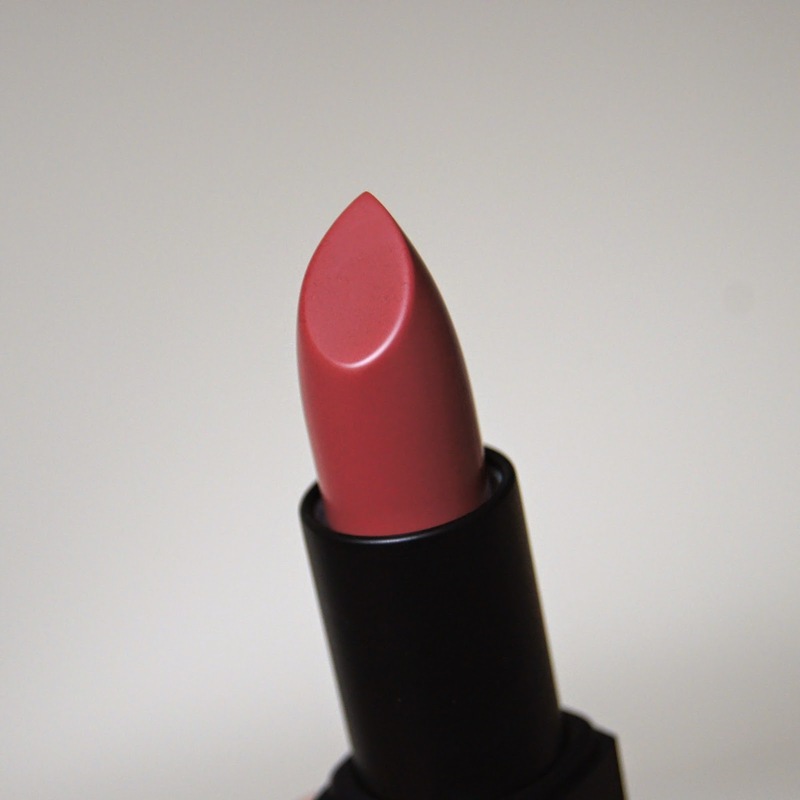 Smoothing out any lumps and bumps, your lips don't need to be in tip top condition to wear this lipstick. It refuses to cling to any dry bits, plumping the lips and giving a glazed, hydrated finish. Like most sheer formulas, the wear time is significantly shorter than drier finishes. Lasting just a couple of hours these take a little more maintenance, but they're fabulous if you don't mind slicking on some extra throughout the day or night. 'Niagara', having a satin texture, creates more of an impact. Stronger pigment, paired with a richer, creamy consistency, this lipstick can be layered to give an opaque coverage. Again, the formula feels soft and smooth during wear, but being thicker and not as glossy, the satin formula lasts for hours longer. 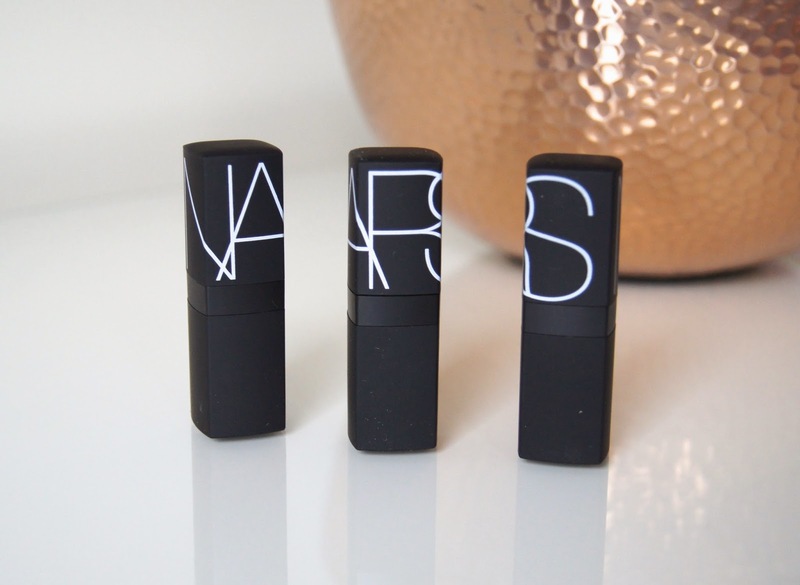 One, little niggle of mine, is the herbal, floral fragrance of Nars' lipsticks. There's no sweet scent of vanilla or exotic fruits added to the formula, like with other brands, there's just the natural fragrance of the ingredients to sniff. It may not linger once applied, but it isn't the most pleasant. Dolce Vita is a glossy, pinky-plum colour. Excuse the cliche, but the phrase 'my lips but better', comes to mind. As the formula is so sheer, it looks almost like a tinted lip balm. If you want to wear a deeper colour to your Autumn/Winter lipstick repertoire, but aren't a fan of anything too bold or intense, this is a great shade. Mayflower is a shade I've been toying with for a long time, entering and leaving my Space NK basket many times. Described as a raspberry by Nars, I'd say that this translates as more of a deep, rosy pink, on my lips. A tiny amount of barely visible, silver shimmer adds to the glossy look of the lipstick, but it isn't harsh and you could easily miss it. When applying the colour directly from the bullet, a gritty texture is apparent, but, once finished, it's not at all noticeable. Although sheer, the formula still adds a good amount of colour to the lips, but it keeps that juicy, translucent look. 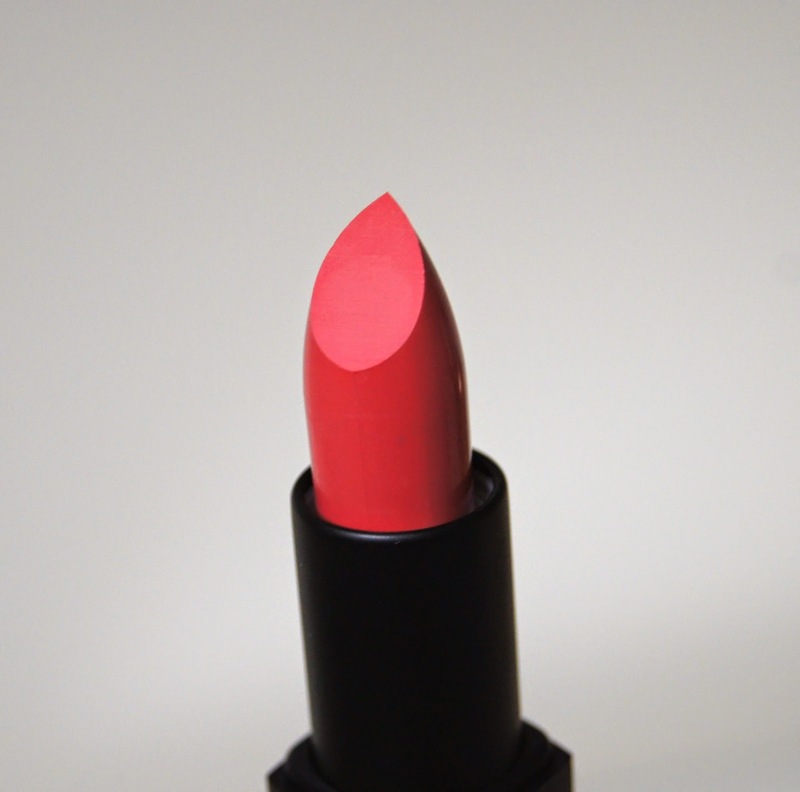 Niagara is a bright, pink-toned coral shade that's instantly brightening, for any skin-tone. 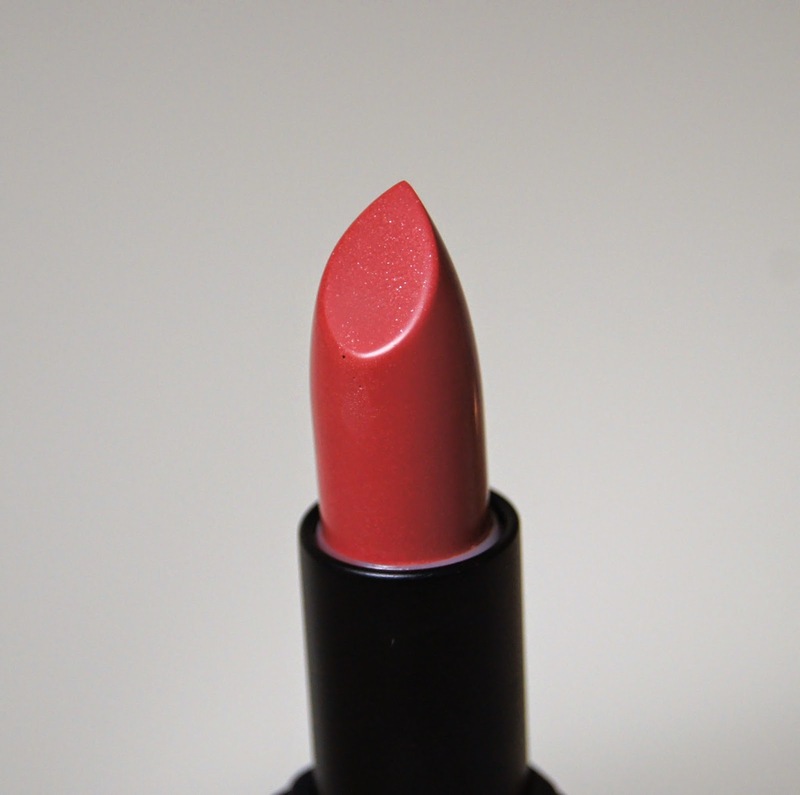 Free from shimmer, this lipstick has more of a creme finish with a buttery sheen to it. With Autumn/Winter approaching, this shade probably won't be sported as much as the others, but I'm desperately getting as much use out of it as possible, before the sun disappears for good. Used alongside lipliner, this shade makes for a super statement lip, but a quick swipe on it's own gives it a more relaxed feel. Costing £19.50, these lipsticks sit somewhere in the middle of the high-end cosmetic spectrum, being more expensive than the likes of MAC, but making YSL look like thieving so-and-sos. Some of the smallest and most compact lipsticks I've come across, these are definitely at risk of getting misplaced in my makeup bag. I've divulged my distaste for Nars' rubberized casings before, as the products never look new for long, covered in scuffs and makeup brush marks. When they are brand new and clean, though, they're lovely. 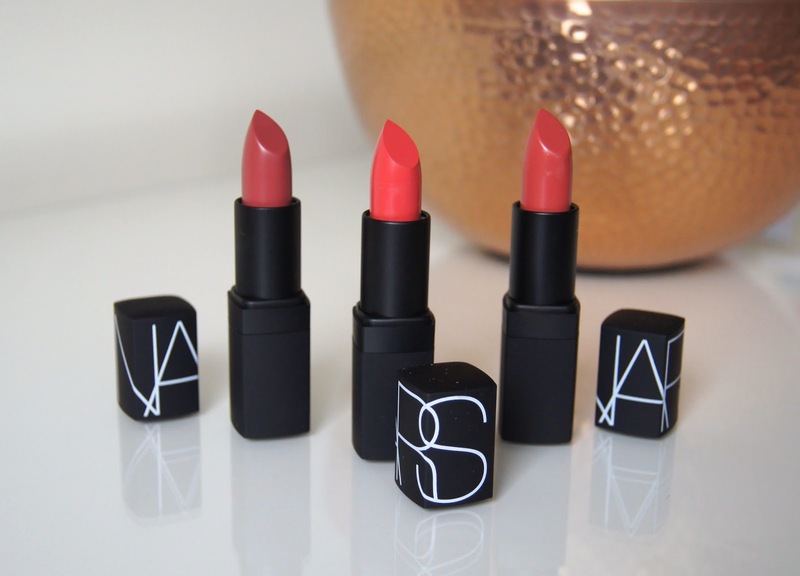 Have you tried any lipsticks from Nars? Which shades do you love?